For most in the cryptocurrency sphere, Ripple is known as the 'Banker's Coin' as its primary mission is to help integrate banking platforms onto the blockchain. 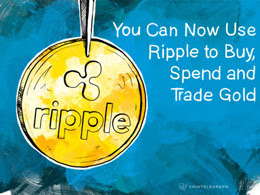 But now on April 5 we can add a new addition to its overall scope as Ripple has signed into a partnership with BPG Group to accommodate the trading of precious metals on the Blockchain. Known as eMetals, this Ripple formulated gateway will facilitate its ledger technology to help boost BPG Group's outreach which already exists in its own gold backed crypto known as XAU. Best known for its use within the banking and finance sector, Ripple has recently partnered with a Slovenian company (BPG Group) to facilitate the exchange of physical metals using its consensus ledger technology.